You can find and read the studies that are referenced in the pages of Perspectives on Prostate Disease by searching PubMed, a resource of the National Library of Medicine. The abstracts (short summaries) of the studies are available for free, but in most cases you will have to pay to obtain the full report. Open up your browser's window while connected to the Internet. Type www.pubmed.gov and hit return. In the space after "For," type the PMID (short for "PubMed ID") number that appears with the reference you want. For example, for the study by D'Amico et al, published in 2004 in The New England Journal of Medicine (see "PSA velocity after surgery"), the PMID is 15247353. Click on "Go" or press the enter key. 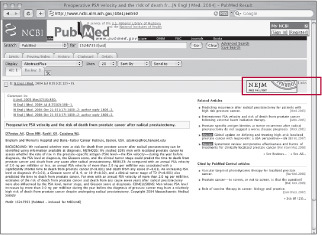 PubMed will retrieve the abstract, which will appear on your screen. If the journal provides a link for purchase — or if a link is provided for a free copy of the article — click on the icon and follow the instructions.